Rainbow flags, rainbow stairs, rainbow eyebrows. Guess what June’s First Fridays at RMG’s theme was. 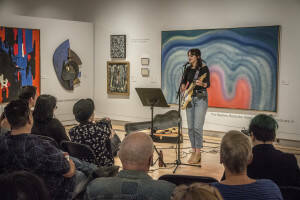 Durham’s LGBTQ+ community and residents came together at the Robert McLaughlin Gallery on June 2 to hear, see, and celebrate the beauty in difference. In the front foyer, guests got an idea of organizations that work with Durham’s LGBTQ+ residents, namely Pride Durham (@pridedurham), and Durham Region Writing Rainbow (@WritingRainbow), an organization dedicated to providing a fun and supportive space for Durham’s pride community, and a pride youth focused (up to age 29) writing group based in the Petticoat Creek branch of the Pickering library respectively. “We actually started in 2011, but went on a bit of a hiatus until we got a grant from the Ontario Trillium Foundation in 2015,” Executive Director Brendan Tihane, of Durham Region Writing Rainbow explained. Anyone wanting to check out or share their work, can visit them at the Pickering library conference room on Saturdays from 2:00 to 4:00 p.m., or attend their open mic nights where new zine issues are ready for pickup. 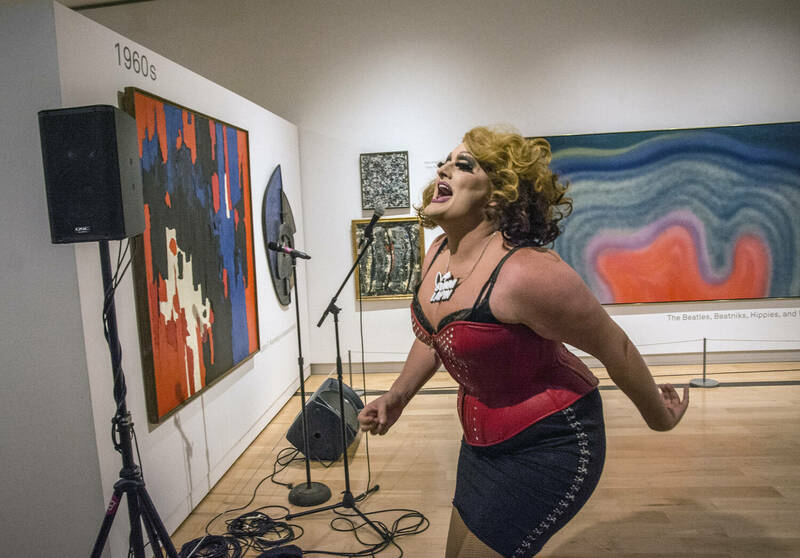 In the main gallery, guests were treated to performances by upcoming performers Lauren Dillen, and Scott Auguste, as well as headlining drag queen Bunni Lapin, whose numbers were as glorious as her outfits and personality. Also known as Andrew Pelrine, Bunni’s career blossomed in Halifax’s drag scene, and the move to Toronto seven years ago helped her career flourish with a touch of familiarity. “I love coming to Durham to perform for you guys because it reminds me so much of home!” Bunni said before performing Lady Gaga’s A Million Reasons in a cream sequinned gown and five-inch heels. Downstairs, the First Fridays’ Film Feature was Lyra Allard’s His Story, about a young Black transman’s journey to becoming his full identity, which exposes various struggles ranging from isolation, family tension, and homophobia in the Black community. Across the hallway, guests were invited to take in artwork from established and closet-artists, who created their ideas of ‘Home’ (June 1-18), as June also happens to be Seniors Month, the competition and exhibition featured artists 55 years old and above. Regardless of age, gender, or how we choose to express ourselves, we’re all in this region together. Why not enjoy each other’s art and company? Celebrate with us again at next month’s RMG First Fridays, or drop in another day to admire our work, or say hi.